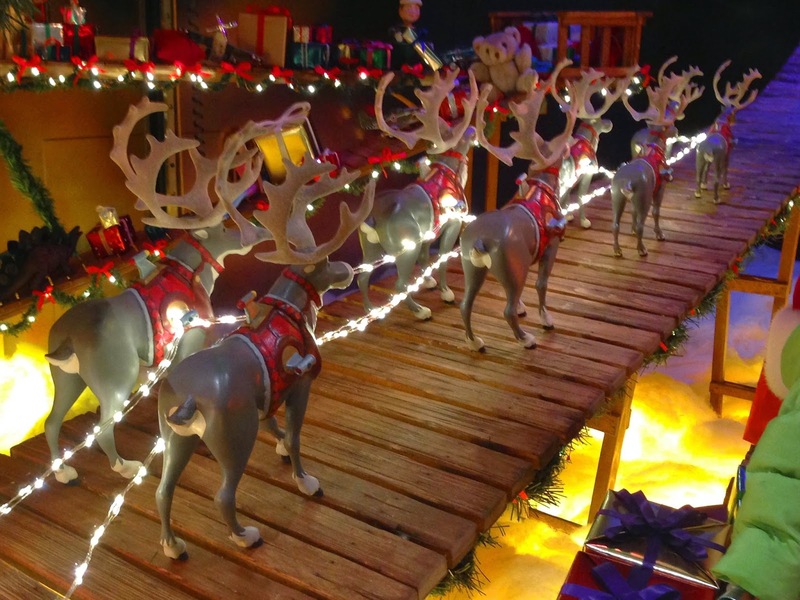 5 Santa sleighs, 3 different sizes, 40 reindeer in assorted poses and scales for 5 of the 6 Macy's fabulous Christmas windows this year. I've been responsible for sculpting featured elements in these famous windows a number of times in the past. All of those elements were resin coated carved foam or solid cast resin. This project was a radical departure from those methods and materials. All of my sculpting duties in this were performed in front of my computer with Zbrush. For those unfamiliar, Zbrush is a state of the art modeling and texturing program originally developed for the movie and gaming industries. 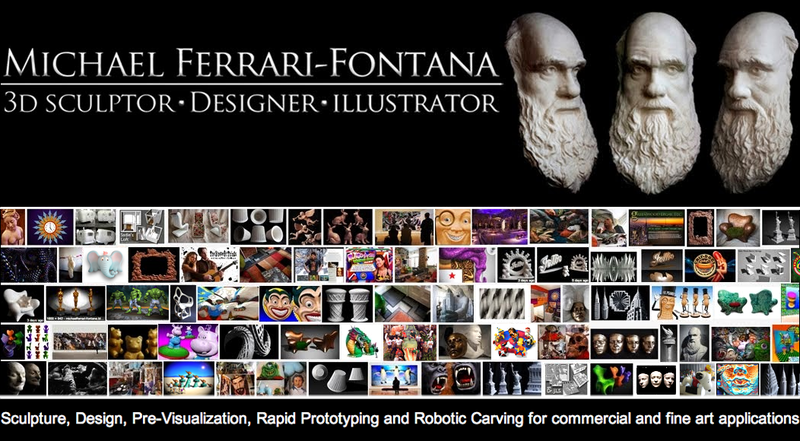 Virtually any shape can be created in it and, any virtual shapes can be made actual through 3d printing and robotic carving. In the not so distant past, a project like this would require so many armatures and clay and tooling and resin and silicone and mold jackets and more resin and time and fingers absolutely sanded down to opened wounds. This was not that case. In this, everything was sculpted in virtual space. Different sizes and scales were simply achieved by rescaling the stereo lithography file (.stl). The objects featured in this post (all shot with my Iphone!) didn't quite pop out of the printers the way that you see them here. Many components needed to be printed and assembled in parts and pieces and all of it was meticulously hand finished and beautifully hand painted by the talented art staff at Standard Transmission. 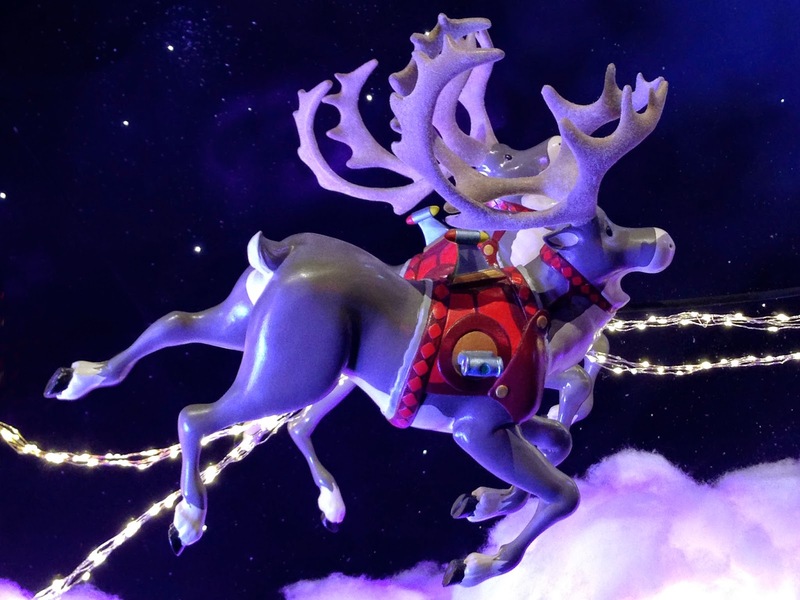 In the image below, Santa's reindeer seem to become smaller in perspective because they actually are smaller in reality. Descending scale is the oldest trick in the diminishing, forced perspective playbook. 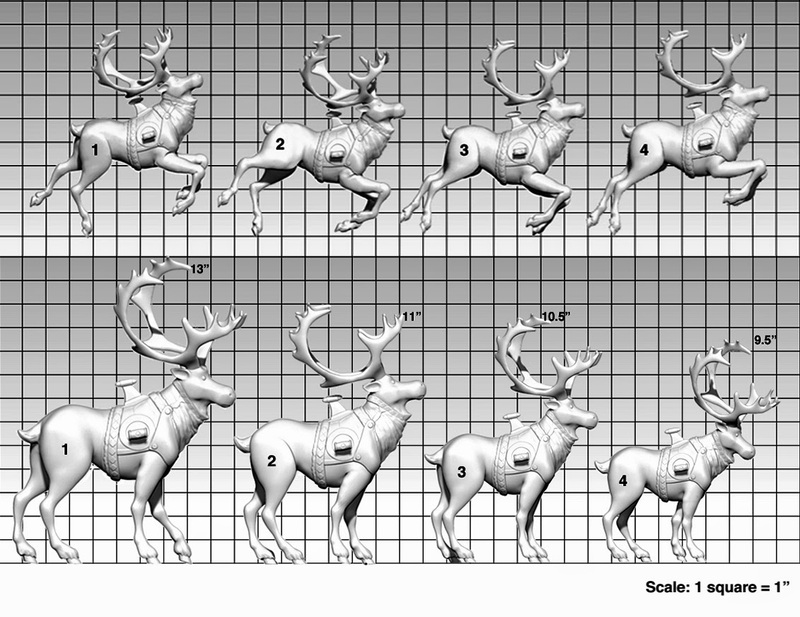 In the good old days this effect would require sculpting, molding and casting each reindeer individually. So gladly, this is no longer the case. 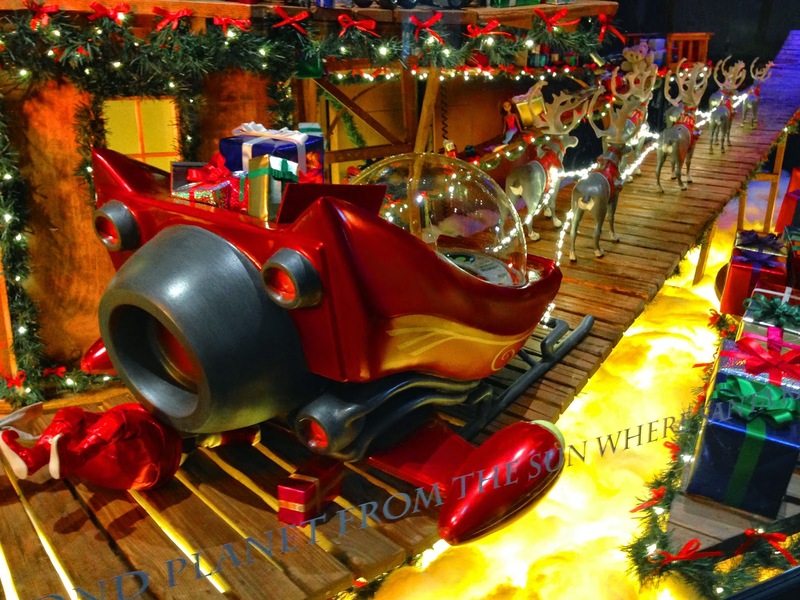 In it's largest example, the Santa's sleigh is about 3 and a half feet long. 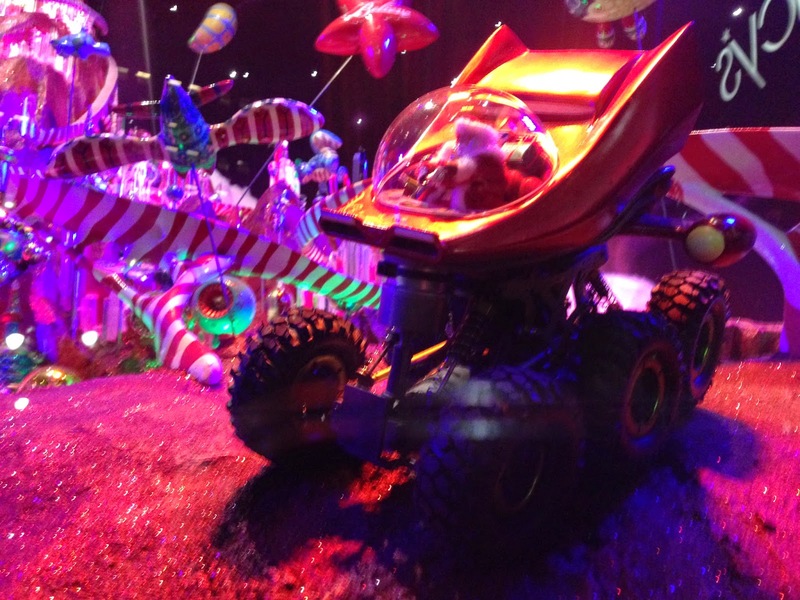 In Macy's Mars window, the sleigh sans runners is mounted on an actual radio controlled toy car chassis. On the other side of this CAD CAM (computer aided design/computer aided manufacturing) spectrum, with not much further development to the model, a life size or larger version could easily be carved by robots in rigid foams, of various densities. This is a very similar method to how the automotive and most transportational industries develop their vehicles. 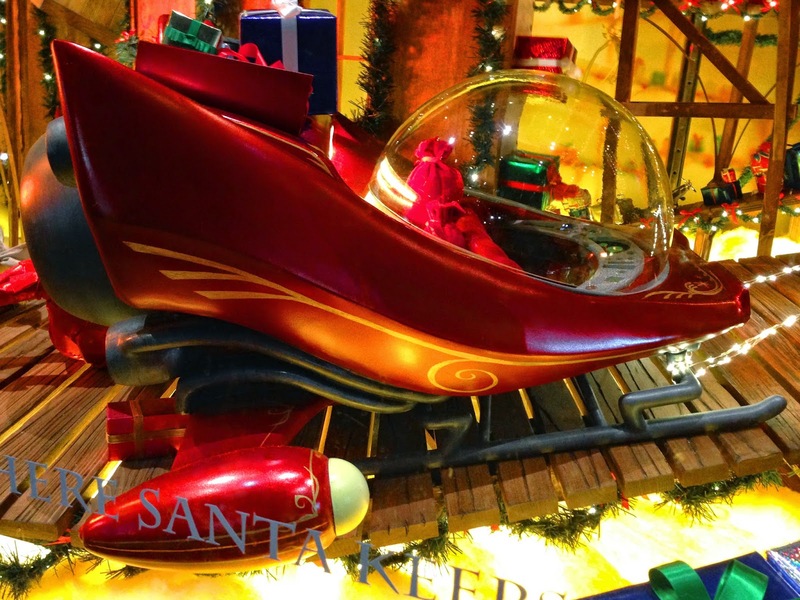 Considering all of that, it is easy to guess that this design and manufacturing technology will eventually make a leap from these wondrous Christmas windows into the Parade Studio. 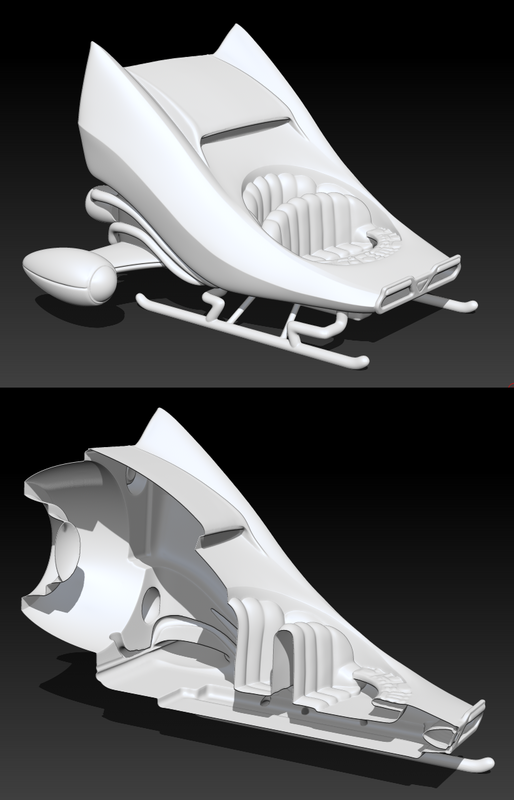 If that should come to be the case, floats and balloons would be sculpted in virtual space. Their components and pieces would be robotically carved or 3d printed on demand. 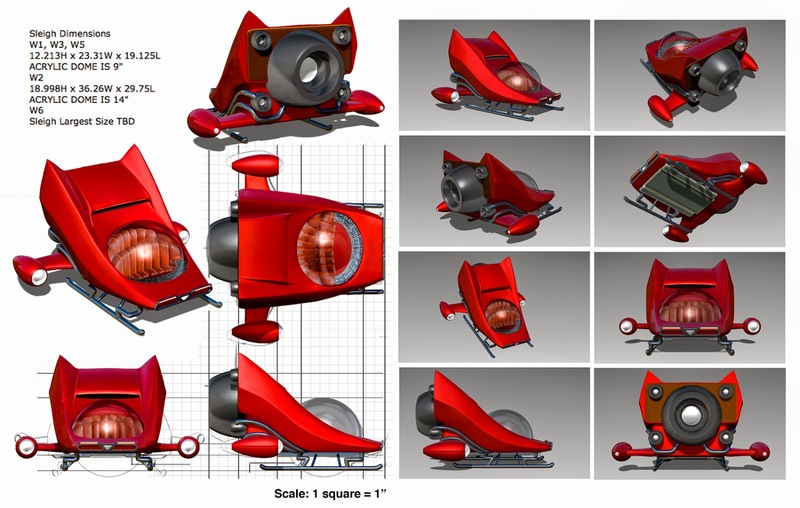 Not only could full size floats and their myriad satellite components such as clown cars and push floats be created in this manner, window sized miniatures could be as well. 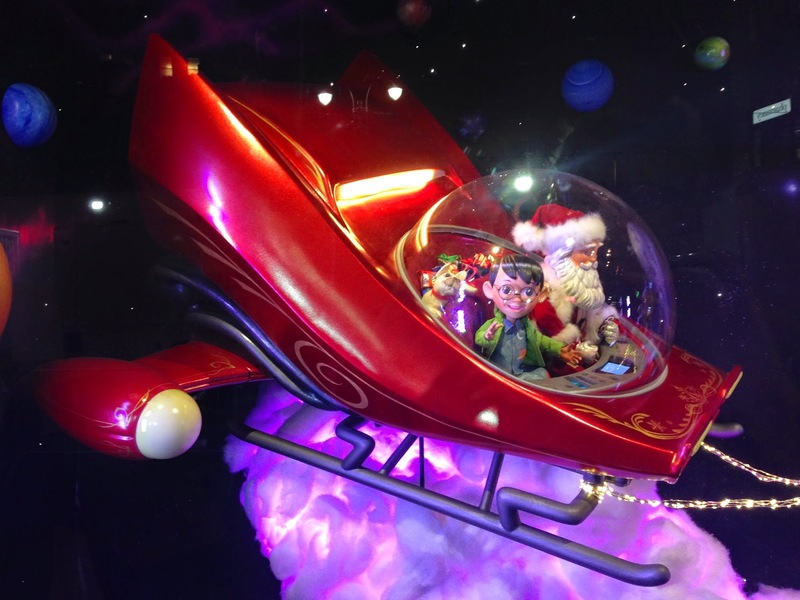 In seemingly magical instances this would merge the Macy's Thanksgiving Day Parade and it's Christmas windows seamlessly. 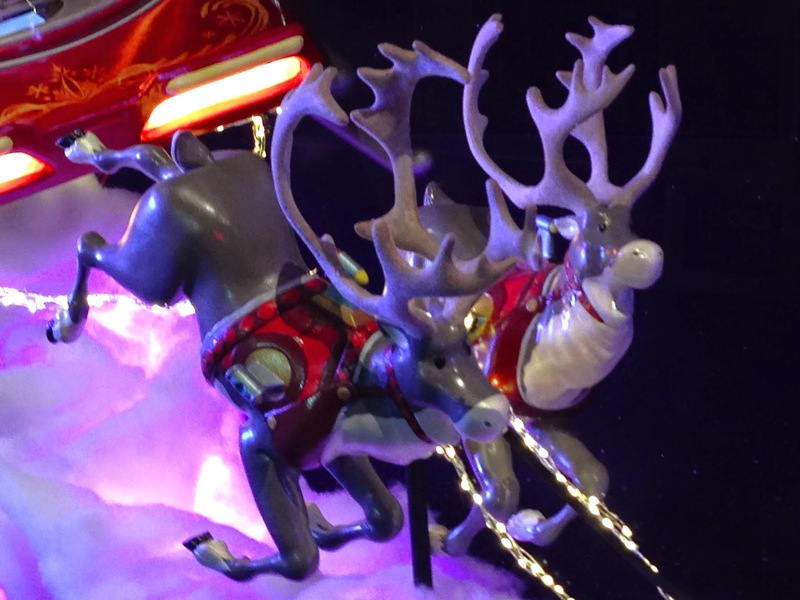 If Macy's renowned helium inflatables were designed this way, models could be printed in a staggering array of different materials and sizes as all of them are rather simple in terms of their shapes compared to the complex constructs of the the floats. Certain balloon models could actually be printed a couple of inches tall in a durable toy plastic. It would be a lovely thing for a client to hold in their hand while pondering their venerable venture. For not an unreasonable amount more, they could be printed in full color and in mass wherein all concerned parties in the design and production process have an actual full color miniature reproduction of the balloon. The communication issues that would be so well addressed by such objects doesn't need explaining. Recently I've been exploring metallic printing. Employing this process will allow me to recreate models in assorted metals ranging the gamut from stainless steel to platinum, with gold, sterling, bronze, and brass in between. The parade has an enormous fan base. Year after year, more than 3 million folks line New York City streets to be thrilled by the parade's unparalleled spectacle and grandior. Another 50 million people glue themselves to their television sets, transfixed by hours of NBC's award winning coverage of the parade. How many of those 53 million mentioned would love to have a gold or polished sterling silver pendant, charm or ear ring of their favorite balloon or float ranging from let's say $100 to $200? The amazing thing about this is that as the files are essentially derived from the original model, not only is it a proportionally perfect reproduction of the balloon, it could be put into jewelry production with almost no additional development costs. Further, as this is a process of printing on demand, the risk of over stocking a particular item that doesn't sell as well as another is greatly diminished and in terms of online shopping, no more pieces than are ordered would ever be produced. 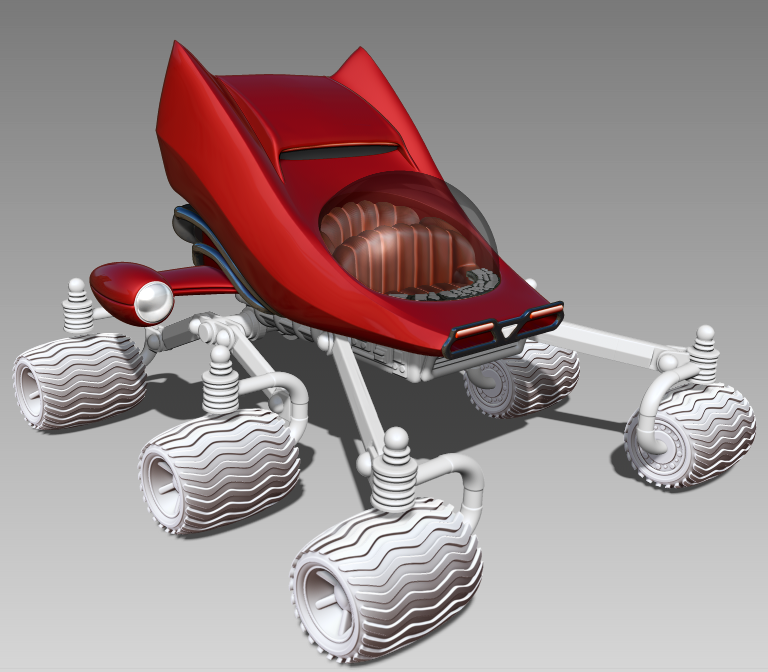 Perhaps one of the greatest advantages of sculpting in the computer is the aspect of pre-visualization. 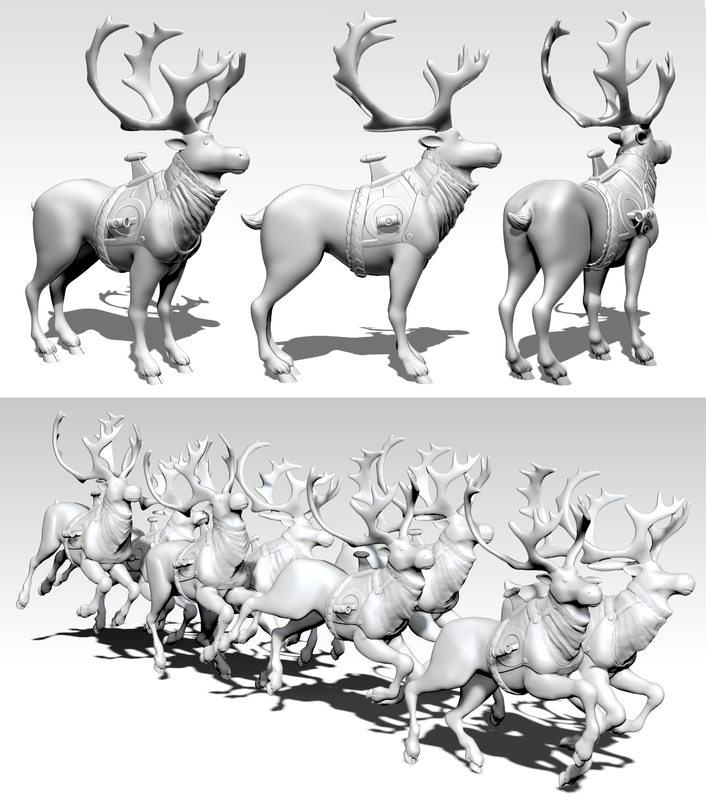 All of the rendering are simply assembled screenshots of the model. 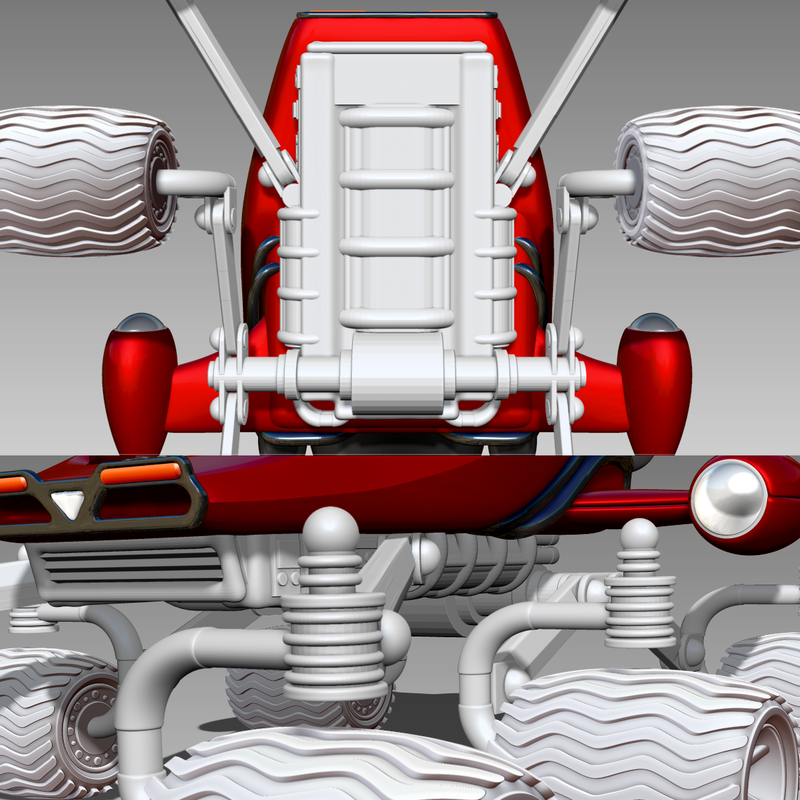 At any point in the sculpture's development, such illustrations can be created in a few clicks, brought into Photoshop for assembly and adjustment and emailed to the client for approval. In instances where visual information is needed more immediately, I'll simply take a shot of my computer screen with my Iphone and text it to the client. If a client needs more information than the 3d renderings can offer, animated turn table movies can easily be provided as well. The illustration below shows the model in whole and in cross section with all of it's parts and subtools integrated into a single watertight mesh for 3d printing. 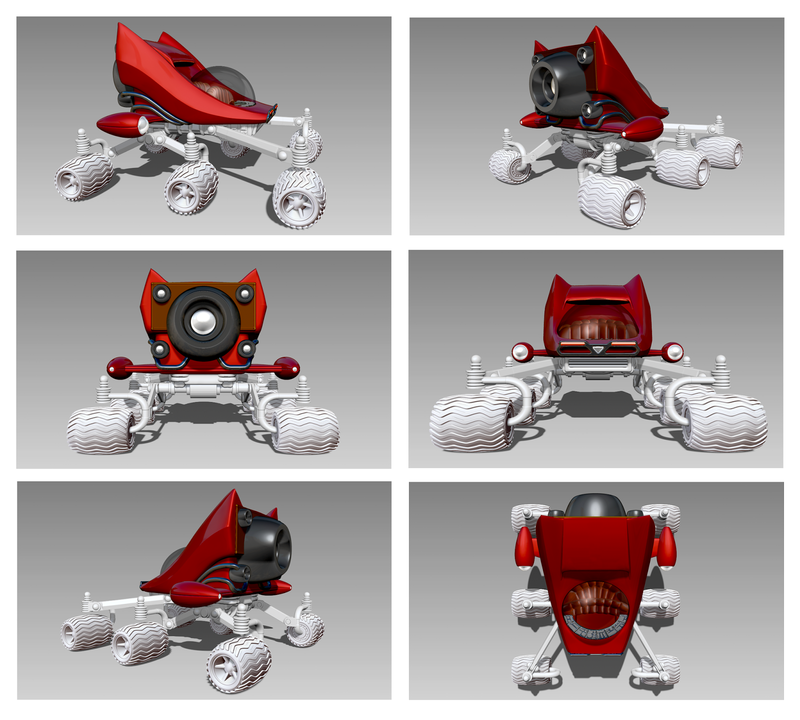 At an earlier point in the project's development a different rover design had been proposed but, was deemed rightly too complicated to animate each wheel independently. Though it wasn't used, I'm still quite proud of this model. The chassis floats on 6 swing arms with 12 pivot points, much in the manner of a marionette. It would also have required 6 individually wired motors and very precise mechanical mounting interfaces between the wheel and the hubs.